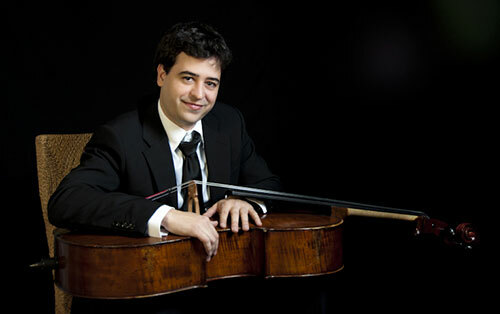 The cellist Gonzalo Meseguer (Murcia, 1984), completed his musical studies at the Madrid Royal Conservatory of Music, graduating with Distinction, a degree shared with the Mozarteum University of Salzburg, where he obtained also a Bachelor’s degree in addition to the official Master’s of Arts degree. He studied with Enrico Bronzi and Giovanni Sollima with whom he completed an intensive postgraduate course, he has also received tuition from the grand masters including A. Kniazev, A.Rudin, D. Miller, Peter Hörr, S. Todorov, Alois Brandhofer, Lluis Calret, W. Boettcher, Miguel Ángel Clares, Wen-Sinn Yang, Radu Aldulescu, Imre Rohmann, Rainer Schmidt (Hagen Quartet), Cordelia Höfer, Götz Teutsch and Christoph Coin among others. He has been an award winner at several national and international competitions, highlights are his participation in the Brahms competition in Pörtschach (Austria), as a finalist in the National Xativa competition, “Certamen Intercentros” and second prize in the “Villa de Cox”. He has been invited to perform as a soloist in chamber ensembles and orchestras at various venues and festivals in Austria, Germany, Italy and Spain among others, “Wiener Saal” in Salzburg and the Frankfurt Book Fair with the Bruno Cavallaro tango company. He has opened young performers recitals, highlights include “Música en La casa-museo de C. Gabarron”, “I Ciclo de intérpretes de la Alberca”, and a soloist performance at the official opening of the Miguel A. Clares auditorium alongside La Camerata de Murcia, debut concert of composer J.L. Garcia. He has participated in the concerts “Los Baños de Alhama”, Holy Week festival of Cajamurcia, Performance at the Casino of Murcia among others. He has also played first cello at the “Junger Kunstler” festival of Bavreuth (Germany), first cello with the World Youth Orchestra (UNICEF) and first cello with the Youth Orchestra of Murcia, in which he played under the baton of Benito Lauret. He is a member of the Royal School of Theatre, Madrid and a member of the Orchestra School of the Royal Theatre of Madrid. As a soloist he has performed with the Youth Orchestra of Murcia, the Orchestra Academy in Italy and La Camerata, Murcia. He has also performed benefit concerts for various entities such as the Veronika hospital for the terminally ill, (Germany), the A.E.C.C. for families with difficulties and benefits organised through the Camposol church, Mazarron. What critics have said about Gonzalo Meseguer “He has a special and original sound, that’s how we describe the cellist Gonzalo Meseguer”. GEA Reutlinger General-Anzeiger …Trully categhory versions due to the quality of his sound, high technicall skills and emotional expressivity that displayed whit his instrument the cellist. Octavio de Juan. Diario La Verdad. plays with an Forster instrument dated from beginning of XIX Century.